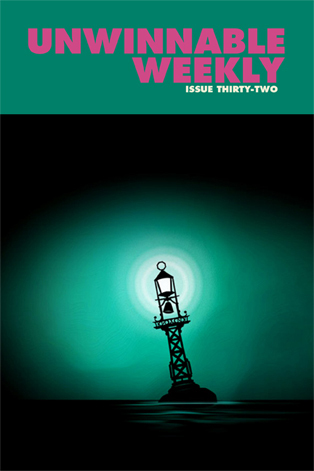 This is a reprint of the letter from the editor in Unwinnable Weekly Issue Thirty-One – check out the excerpts at the end of the post. You can buy Issue Thirty-Two individually now, or purchase a one-month subscription to make sure you never miss and issue! Stu Horvath thinks I might be his evil twin. Either that, or he’s mine. We’re not sure which, just that it’s a little eerie how our thought patterns sometimes align. So it’s not so much surprising as it is a little frightening that the plot we hatched on Wednesday is already barreling along. I barely had time to explain my half-formed idea before Stu was pulling the scotch tape and safety scissors out of the junk drawer to start cobbling it together. Probably, we should stop following each other on Twitter, because that’s where things like this get started. I happened to see Stu lamenting that Blue Ruin, a clever little noir that ended up being one of our favorites movies of last year, had flown under his radar until October, long after its box office premiere. Why had no one told him earlier? Why? Because, who knew? Popular media is bursting at the seams with genre stories. Some are good, some are garbage and no one really knows which of the two Stu is going to like. Except, maybe, me. Because I’m his evil twin. Or he’s mine. Now, I ask you: Does that sound like something an evil twin would do? Anyway, Stu liked the idea, which is how it went from being the outline of casual hobby to the plan for an only slightly less casual arm of the Unwinnable publishing empire. We’re calling it Exploits, both for the way genre stories toy with our hopes and fears, as well as for the way they center on daring adventures. 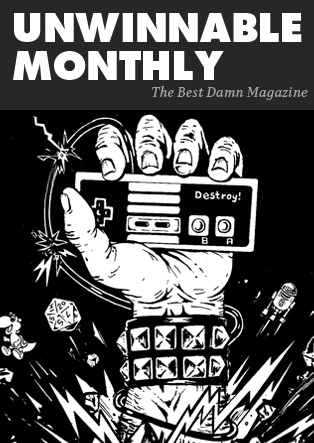 Every other Monday, subscribers will receive a new edition, team edited by Stu and myself, filled with micro-reviews from some of the most discerning genre mavens we know. If that sounds like something that might improve your quality of life, keep an eye on Unwinnable. We’ll have a subscription page up soon. Unless this is all an evil plot one of us has devised to destroy the other. I wouldn’t know anything about that, though. Honest. Thanks L., old buddy, old pal, old evil twin who is probably plotting to murder and replace me. This week, Liam Gibbons returns to Darkshore, where he whiled away his first hours in World of Warcraft. Jeremy Signor examines the optimistic social network at the center of the anime Gatchaman Crowds. I sail the seas of despair in Sunless Sea. Finally, Brian Crimmins revisits Phantasy Star Online and finds a strangely positive take on the then-uncharted territory of the internet. Need me? Drop me a line: stuhorvath@unwinnable.com. Have a great week, folks. And, if I start behaving strangely, blame L.
From this height, Lor’danel is the only splash of color in an otherwise gloomy coastline. From here, it almost looks like it did before the Cataclysm expansion changed everything. It looks like the Darkshore I grew up in. [Gatchaman Crowds has] an optimistic view of the world, to be sure. Are we really naive enough to think that, given the right tools, expertise, and information, we’re all going to work towards a common good? Sunless Sea…is deliberate. It makes you choose your flavor of attrition. The zee is cruel and terrible. Death is inevitable. In this way, Sunless Sea becomes a lesson in futility. It is teaching you to embrace the crushing cold of the ocean’s depths. [Phantasy Star Online’s] vision of the future intrigues me. It takes an uncharacteristically positive view of what was, at the time, a relatively new piece of technology: the internet. Where others saw in it a potential danger, Phantasy Star Online sees in it a potential to bring people together to achieve genuinely great things.